Claus Josef Riedel his superb glass making and the Riedel family history. Josef Riedel was born in 1925 in Polaun, Bohemia. He died on 17 March, 2004, in Genoa, Italy, aged 79. He was president of the world-renowned Austrian family company from 1957 to 1994, when he was succeeded by his son Georg. Josef Riedel, as the former president of Riedel Crystal and was one of the first in this age-old craft to realise that the design of a wine glass could alter the perception of how its contents tasted. In his spare time, Riedel was an avid motorcycle fan, known for taking his Harley-Davidson through the Brenner Pass in good weather and bad. He was married five times, twice to his wife Ute; and was survived by two sons, a daughter and three grandchildren. Soon after taking control of the business, which was founded in 1756, Josef Riedel began experimenting with the shapes of wine glasses. He concluded that a wine could taste notably different in variously shaped and sized glasses. He spent 16 years studying the physics of wine delivery to the mouth and taste buds and experimenting with different glass configurations, matching them with wines of different regions, different grapes and different ages. 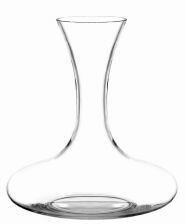 The size of a glass, its thickness, the shape of its bell and the diameter of its rim contributed materially to the taste of the wine drunk from it, Riedel came to believe. The wine’s balance, depth, harmony and complexity, he discovered, could, and often did, change from one glass to another. 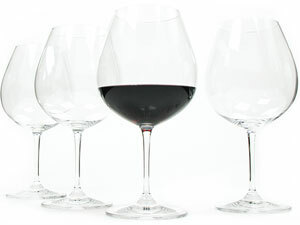 The first wine-specific Riedel glass, the Sommeliers collection, was introduced in 1973. Under his son Georg’s direction, the line eventually included special glasses for California zinfandel, tequila and single malt Scotch whisky. At that point, Claus Riedel was already well known for his 1958 Burgundy Grand Cru glass, which is still said to be the world’s largest wine glass. It holds 37 ounces – about 50 per cent more than the standard wine bottle. 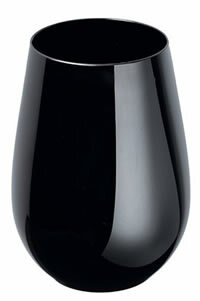 It, along with 127 other Riedel glasses, is in the permanent design collection at the Museum of Modern Art in New York. In 1959, Riedel’s Exquisit Bordeaux glass was named the most beautiful in the world. The Riedel family and its affiliation with glass can be traced back to Johann Christoph Riedel 1st generation who became known as the “Ur Riedel” – meaning the original Riedel. In 1723, Johann Christoph Riedel was murdered as he returned from his travels as a glass trader, the two murderers believing him to be carrying a lot of money. Johann Christoph’s story became famous, being retold all around Bohemia, from generation to generation. The circumstances of his death are identical to the murder described by Friedrich Schiller in “The Cranes of Ibykus”, written in 1895, and it is thought that the terrible story may have inspired the great author. The Riedel story of glassmaking, however, goes back over 250 years, when the first Riedel glassworks was established in a northern Bohemian forest. It was Johann Christoph’s grandson, Johann Leopold (3rd generation), who proved to be an entrepreneur along the lines of the modern day Riedels. Working his way up through the ranks of his cousin’s glassworks, the young Riedel excelled as a glassmaker, but this was just at the time when the glassware market fell dramatically, and they had to close the glassworks. Before too long, with the help of a loan and an upturn in the market, the furnace was stoked up again. By 1756, the loan repaid, and the business successful, Johann Leopold, the third generation of Riedels, was allowed by the local Count to run the business independently under lease, and thus the first Riedel glassworks was born at Zenckner in Antoniwald, just at the same time that the Seven Years War began. Hardly was the new glassworks finished in 1775, and production flourishing, when a new crisis loomed on the horizon – the Bavarian War of Succession, where the Prussians went marauding through the countryside, torching other glassworks in the Jizera mountains. Johann Leopold’s typical Riedel character showed through, as he ignored all personal danger and threats to his business, and sheltered several families from Prussian-occupied towns and villages in the area. After the death of his father Johann Leopold’s eldest son Anton Leopold (4th generation), continued the main branch of the Riedel family. He took over the Neuwiese glassworks with a similar verve for the business as his father. Prosperous times were interrupted by the Napoleonic Wars, which crippled international trade, leading to a stagnation in sales, and ultimately a depreciation in currency. Anton Leopold, fourth generation, then set about experimenting with various production methods, and new forms of distribution. A glass enhancement works was his next project, where he put his two sons in charge, one of whom, Franz Xaver Anton (5th generation) demonstrated an extraordinary talent for engraving, and became a gifted glass artist. When Anton Leopold died in 1821, his son Franz Xaver Anton faced rosier times. The economy was picking up and the fashionable Biedermeier style with its romantically idealized watercolours, suited the Bohemian glass makers well. They were heading for a new boom. Franz Xaver Anton, proved to have the typical Riedel head for business, as well as a tremendous amount of artistic flair – a rare combination! Franz Xaver Anton’s era can be seen as a link between the old forest glassworks and modern industrial production as we know it today. The demand for fancy beads, buttons and jewellery, known as “notions” became widespread, and soon the production for these notions was running at full capacity. Better glass quality and the development of interesting new colours such as yellow and green uranium glass put him firmly on the cutting edge of the glass industry. Franz Xaver Anton had a flourishing stable business, but no male heir, only his beloved daughter Anna a woman was unthinkable. So, in 1830, Franz Xaver Anton brought his 14 year old nephew Josef into the business. The sixth generation Josef works his way up through the company, willingly taking on any chore in order to immerse himself fully in the workings of a glassworks. Four years before the death of Franz Xaver in 1844, the Riedel dynasty’s line of succession was solved by the young Josef marrying his cousin Anna Maria, Franz Xaver’s daughter. Josef Riedel was a hugely motivated, highly successful businessman. In 1849 he expanded the business further with the purchase of another glassworks. Josef Riedel became known as the Glass King of the Jizera mountains, and everything was going well in his life until his beloved wife Anna Maria was to die in 1855 at the age of 36, leaving four children. Such was his grief, that Josef could not remain in Antoniwald, but instead re-located to his new works in Unter-Polaun, where he threw himself into his work. In 1859, Josef married Johanna Newinger, and in 1866 he began the construction of another works next to the one in Wilhelmshöhe to replace the original Antoniwald Zenkner works. There was no stopping the Glass King. The business expanding further and further and his four sons, Otto, Hugo, Wilhelm and Josef (the fourth son was from his second marriage) began working in this large-scale business, although Josef Senior showed no signs of slowing down himself. He introduced gas furnaces, which were fed by coal and therefore put an end to the strip logging of forests. The Glass King was decades ahead of his time. He did not stop working until his death in 1894, leaving his son Josef Riedel Junior, a glass empire unrivalled in the world. Josef Riedel Junior, seventh generation, obviously had a very hard act to follow. He decided to plough his own furrow and not try to emulate his father, concentrating on other areas of the business, where he could become established in his own right. One thing he shared with the Glass King was a great love for glass, and dedication to innovation. Josef Junior succeeded in developing a machine that mechanized the drawing-out rods and tubes necessary for the production of beads from one to four millimetres – a milestone in the history of glass production. Josef Riedel Junior died in 1924. From being one of Europes greatest industrialists, he was to endure ten years internment in Russia. On his return from service as an artilleryman in Italy in World War One, Walter began to work in his father’s company, taking the helm on Josef’s death in 1924. There was a global depression in the 1920s culminating in the crash of the New York Stock Exchange in 1929, after which national protectionism in Germany spread, with exports shrinking and unemployment growing. Walter commanded a great presence, and his achievements were many and varied. Shortly after the war broke out, Walter began making fine, spinnable fibreglass for the production of rope wool. Another industrialist, Werner Schuller developed a new method for spinning fibreglass without platinum, which was patented. The Ministry of Aviation recognised a military application for this material, and more or less coerced Riedel and Schuller to enter a joint venture to produce it. The Ministry then asked Walter if he could produce a 76 centimetre glass screen, when at that time, the maximum achievable was only 38 centimetres, and no one thought it possible to produce a screen of more than this. Three weeks after being asked, Walter riedel turned up in Berlin with a 76 centimetre tube, astonishing the military with his technical wizardry and for which he was later to pay with ten years of his life. The end came for the Riedel Glass Company in May 1945. When the Russians marched into Poland from the north and Czech partisans swept in from the south. Walter Riedel received an order from the new Czechoslovakian government to continue to run the now nationalised company – the entire Riedel fortune was claimed by the state – two hundred years and eight generations of work disappeared virtually overnight. 16 days after the US dropped the atomic bomb on Hiroshima, Walter Riedel was taken into custody, and was sent to a camp in Eastern Siberia, thereafter being transferred to Russia as a “forced contractor”, where at first he helped to rebuild Russian glass factories. When his five-year contract was up, Walter tried to leave, but the Russians had other plans. He appealed to the Austrian Embassy in Moscow, only to be arrested as a spy for allegedly telling the Embassy about his work – he was sentenced to 25 years imprisonment. After Stalin’s death and German chancellor Adenauer’s great efforts on behalf of prisoners of war, however, he was able to return home in 1955. While Walter was in Russia, his son Claus, ninth generation, made his great leap to freedom, ending up in Austria, where finally the Riedel fortune took a turn for the better. Claus had landed 17 kilometres from the village where one of his fellow prisoners lived. He walked to the village through the snow in his thin cotton prison uniform, until he reached the village, where he was given a warm welcome. The head of the local glassworks, Swarovski, had heard that there was a Riedel in town and asked to see him. Swarovski had been taught the art of glass making by Claus’s great grandfather Josef, and took Claus under his wing like a son, even sending him to university to study chemistry. Claus Riedel, now married to Italian Adia, whom he had met in Italy during the war, moved around doing various jobs between 1951 and 1956, ending up in Innsbruck, Austria. This was around the time that the Swarovskis were approached to take over a glass works in the small town of Kufstein near Innsbruck in Austria, but they declined as the production of stemware did not fit their profile. Claus had no capital to buy the glassworks, but the Swarovski’s advanced him the money, and Claus Riedel took over the bankrupt Tiroler Glashütte, today’s Riedel factory. After a period of readjustment, Walter threw himself into the new business with his son, but they had quite different ideas in terms of priorities – Claus was very keen on the production of stemware and Walter preferred high output items. This led to an inevitable conflict. Such conflict between the two generations was considered very healthy in the Riedel family, leading to the family motto – “stoke the fire, don’t save the ashes”. The Riedel glass works had a brand new direction – unadorned, delicate, fine wine glasses. In his 1961 catalogue, Claus Riedel displayed for the first time his vision of glasses specially made to enhance specific styles of wine. He distinguishing the Riedel company more than ever before, as to date the fashion in stemware had been dictated purely by aesthetics, not function. The handmade Sommeliers series was launched in 1973, introducing the revolutionary new concept to the wine trade and changing the world of wine glasses forever. In his research into how the shape of a glass affects the wine inside, Claus discovered one major factor – that virtually every glass people drank wine from was too small to do justice to the wine. The Sommeliers Series was showered with prizes from around the world. Georg Riedel, tenth generation at Reidel Glass, further developed Claus’s theories. He producing grape-specific glasses, and mechanized the production of fine wine glasses with his Vinum series, making Riedel glasses far more affordable to wine lovers the world over. A milestone in the modern Riedel company is the founding of a Riedel company in the United States, which came about following an encounter between Robert Mondavi and Georg Riedel, showing real commitment to the US market. While Claus was a talented designer, as recognised by the National Olympic Committee when they commissioned him to design and produce vases for the 1968 Olympic Games, his son Georg brought a calming, analytical eye to the business, soon spotting weaknesses in the corporate structure. As Georg took over more and more of the strategy for the business, Claus gradually became less involved, until Georg took the helm of the company in 1987. Georg has made it his life’s work to develop specific glasses to enhance individual wines, travelling around the world to carry out workshops with experts in their field to develop a whole array of glasses from Tinto Reserva to the Single Malt glass. As the world of wine continues to grow, Riedel will always have scope to develop yet more glasses. With the tenth and eleventh generations of the Riedel family, Georg and Maximilian, the Riedel family history continues to be written. Eleventh generation Maximilian, who runs the Riedel company in the US, has already made his mark in the world of wine glasses, with the development of Riedel O – stemless wine glasses, which are wine specific. This relaxed approach to glassware has already achieved amazing success, showing that there is always room on the market for new ideas and innovations. Georg’s tremendous talent for strategic thinking led to the Riedel acquisition of the German glass company F.X Nachtmann in 2004. Georg took this momentous decision for the Riedel company because he sees potential for incredible growth in the machine-made glass sector. There will always be a market for fine, hand-made glasses, but on the machine-made side of things, there is far more competition and it is vital to remain ahead of the game. There are three brands in the modern Riedel Glass stable – Riedel, Spiegelau and Nachtmann … all positioned clearly in the market place. Georg Reidel is living up to the impressive past of his ancestor Josef Reidel through sheer determination, innovation, dedication and forward-thinking to ensure the continued success of the Riedel Glass company for generations to come. A springboard has been created for penetration into glass markets all over the world, and the Riedel Glass company appears poised to take the next leap.